Ertiga Suzuki Sport has been launched in Indonesia. The standard Ertiga is already on sale in Indonesia. The Ertiga Suzuki Sport gets an exterior kit and an all-black interior. It falls under the Suzuki Sport division. Powered by the same 1.5-litre petrol engine that powers the standard Ertiga. The Ertiga Suzuki Sport is a 7-seat MPV, not a 6-seater. The Ertiga has received the Suzuki Sport treatment in Indonesia. As the name suggests, the Ertiga Suzuki Sport is a sporty looking version of the 7-seater MPV, which is on sale in India as well. Since Maruti Suzuki is eyeing to offer a more premium version of the Ertiga under its premium Nexa outlets, we can’t help but wonder if it will be based on the Ertiga Suzuki Sport. 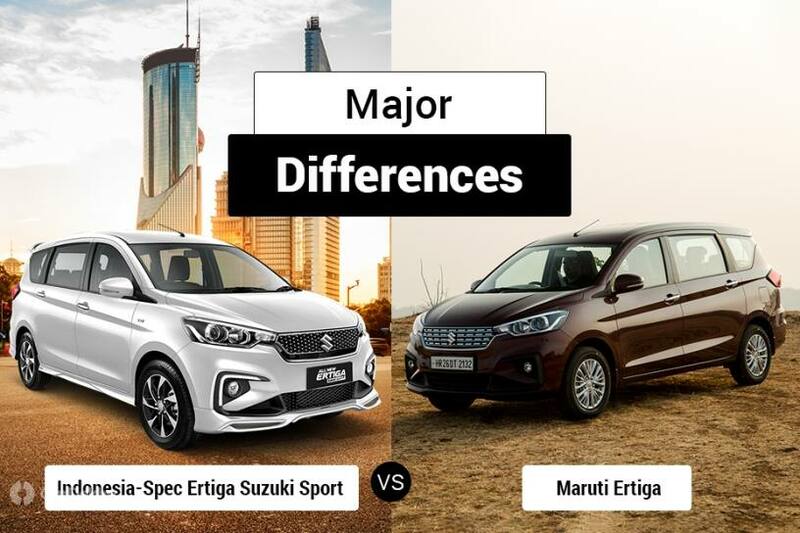 For now, let’s compare the India-spec Ertiga with the Ertiga Suzuki Sport and find out the major differences. Except for the increased length, the Ertiga Suzuki Sport is identical to the standard Ertiga. The Ertiga Suzuki Sport gets redesigned front and rear bumpers. 1. New grille: The Ertiga sport features a mesh pattern on the front grille. Despite this being a sporty version, Suzuki has opted to offer chrome inserts on the grille. The standard Ertiga in India gets horizontal slats and a heavier dose of chrome on the front grille as compared to the Ertiga Suzuki Sport. Other changes up front include a mesh grille on the central air dam instead of horizontal slats seen on the India-spec Ertiga. 2. Daytime Running Lights: The Ertiga Suzuki Sport also gets LED DRLs on the fog lamps housing; the housing is otherwise designed in the same way as on the standard Ertiga. 3. Body kit: The Ertiga Suzuki Sport gets underbody spoilers at front and rear, side body skirting and a tailgate spoiler. 4. Dual-tone 15-inch alloys (similar to the ones on the standard Indonesia-spec Ertiga): Maruti Suzuki also offers 15-inch alloy wheels on the Ertiga, but these are not dual tone. The 7-spoke alloy wheels on the Ertiga Suzuki Sport look sportier than the ones on offer in India. 5. Colours: The India-spec Ertiga is available in five colours -- red, grey, blue, white and silver. The Indonesia-spec Ertiga Suzuki Sport, on the other hand, is available in three colours - white, grey and black. While the India-spec Ertiga gets a beige-black interior theme with faux wood inserts, the Ertiga Suzuki Sport gets an all-black finish with faux wood inserts. However, even the Ertiga Suzuki Sport is a 7-seater MPV like the MPV we get in India. The upcoming premium MPV from Maruti Suzuki will feature 6-seats. We believe this version could be inspired by the Ertiga Suzuki Sport. In the Ertiga Sport, Suzuki has also introduced an additional feature in the form of rear parking camera, which is not available on the standard Indonesia-spec Ertiga. The India-spec Ertiga, however, is already equipped with a reverse camera. It also gets Apple CarPlay and Android support for the 7-inch infotainment unit, which is not on offer in the Indonesian market. As we have already said, the Ertiga Sport is just a cosmetic update. So, it is powered by the same 1.5-litre petrol engine that also powers the standard Ertiga, both in India as well as in Indonesia. The petrol engine makes 105PS of power and 138Nm of peak torque and can be had with a 5-speed MT as well as a 4-speed AT in India. The Ertiga sold here is also available with a 1.3-litre diesel engine that makes 90PS and 200Nm, paired to a 5-speed MT. Suzuki has not yet revealed the prices of the Ertiga Suzuki Sport. However, it is likely to attract a slight premium over the standard MPV, which is priced from Rp 196 million to Rp 240 million (Rs 9.52 lakh to Rs 11.66 lakh). In India, the Ertiga petrol is priced from Rs 7.44 lakh to Rs 9.95 lakh (ex-showroom Delhi).